Individuals who have completed Wilson Reading System® (WRS) Level I Certification may seek WRS Level II Certification. This advanced WRS coursework provides in-depth strategies to expand knowledge and practice of the Wilson Reading System. Completion of WRS Level II Certification makes one eligible to receive the professional credential of Wilson® Dyslexia Therapist (W.D.T.). The tracks may be completed in either order (group then Steps 7-12, or vice versa) or during the same period of time. Availability of appropriate practicum student(s) may help determine which option is best for your situation. 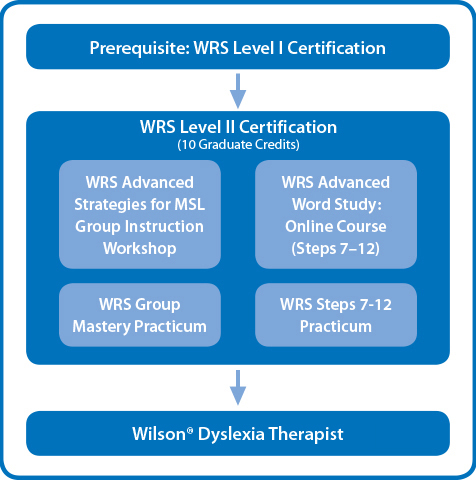 Successful completion of all four advanced courses results in WRS Level II Certification and eligibility to receive the professional credential of Wilson® Dyslexia Therapist (W.D.T. ), but this does not qualify one as a Wilson® Credentialed Trainer. Wilson commends educators who demonstrate the dedication and expertise needed to reach this high level of achievement. Interested in registering? The current WRS Level II Certification coursework continues to be available in WRS 3rd Edition. Information about WRS 4th Edition enhancements to WRS Level II Certification will be available for the 2019-2020 school year.